I had a hard time finding this product in stores and I am glad I found it here on well! It's very fresh and smells good. My chinchillas love it! They need these in larger bags! This product is not easy to find so I love that I can rely on Well.ca for it! 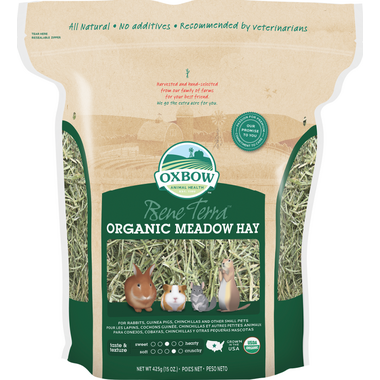 A big thumbs up for Organic and my rabbit loves it! This hay smells good and fresh and it's a nice green colour. My rabbits enjoyed it very much!